The vital records department within the Johnson County Health Department serves as a local source for those county residents who wish to obtain copies of birth and death certificates. The appropriate applications are provided on the department's website. Those applications must be notarized prior to being turned in at the Health Center at 429 Burkarth Road in Warrensburg, MO. Applications can also be submitted by mail to primary state health department, at Bureau of Vital Records, Missouri Department of Health and Senior Services, P.O. Box 570, Jefferson City, MO, 65102. The appropriate fee must also be sent in with the application, and must be sent in either a check or money order. 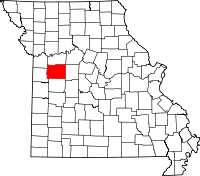 Also in Warrensburg in the Johnson County Courthouse on 300 N Holden St are the Recorder of Deeds and the Circuit Clerk, whose offices are in charge of property and marriage records, and civil and criminal records, respectively.